During Tuesday’s Press briefing, Sarah Sanders smacked down American Urban Radio White House Correspondent April Ryan for asking whether President Trump has considered resigning. April Ryan was called on by Sarah Sanders to ask a question. Initially, April Ryan asked why the FBI raided Michael Cohen’s office if he had been coopering with prosecutors. In April Ryan’s follow up question she asked if President Trump had considered resigning after the turmoil this week. “With all of this turmoil, particularly this last week, has the president at any time thought about stepping down, before or now?” April Ryan asked. Sarah Sanders shut April Ryan down and called on the next reporter. This is the leftist media today. They disregard the thuggery carried out by crooks like Rod Rosenstein and Robert Mueller and demonize President Trump. 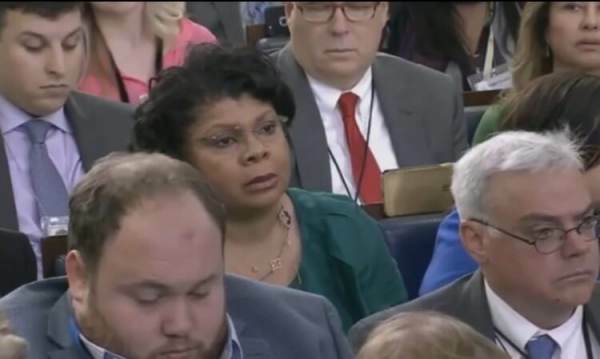 The post ‘Absolutely Ridiculous Question’ Sarah Sanders Shuts Down April Ryan For Asking Whether POTUS Will Resign (VIDEO) appeared first on The Gateway Pundit.